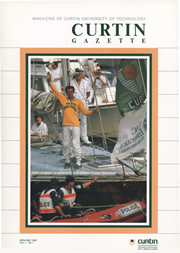 The Project Endeavour team managed the preparation program for the solo, non-stop, triple circumnavigation of the world undertaken by Jon Sanders and the two year voyage from 25 May 1986 to 13 March 1988 itself. Funded by the Parry Corporation and endorsed as an Australian Bicentennial Activity, Project Endeavour was managed by a Committee formed under the umbrella of Curtin University's Centre for Marine Science and Technology (CMST). - locate and claim the Great South Land. This goal led to the endorsement of Jon Sanders' voyage as an official Australian Bicentenary Activity. return home following his triple circumnavigation of the world. Vol. 1 No. 1. CUL00050/3. At that time, CMST was part of the Western Australian Institute of Technology (WAIT) which became Curtin University of Technology in 1987. As well as its overarching management role, CMST had particular responsibility for the scientific research to be undertaken on the journey. CMST was responsible for experimental design, gear mobilisation, selection of consultants, the training program associated with the scientific package and the reporting of results. Challenger, a 14m foam sandwich construction sloop, was purchased by Kevin Parry for the voyage. 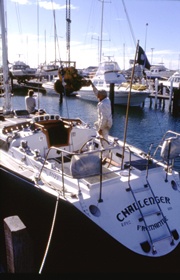 Designed by WA naval architect Phil Curran in 1978, the Challenger was built by Perth contactors for Dr Jim Chute who sailed her in the 1979 Parmelia Race from Plymouth to Fremantle in commemoration of WA's 150th anniversary. 4 The yacht was renamed the Parry Endeavour for Jon Sanders' journey. official launch for Sanders' voyage, December 1985. The Parry Endeavour was equipped with a scientific package to record sea surface temperatures, wildlife sightings and bathymetric measurements. Challenger [Endeavour]: old engine removal, ca 1986. CUL00039/9/3.